As any country that has held the Olympic Games will testify, it is a mammoth challenge, but what about hosting both the soccer World Cup and the Olympics within two years of each other? That is challenge that could prove daunting for any country, even an experienced one. And, unless some action is taken to improve Brazil's infrastructure, it could prove very difficult. And, while the 2016 Olympics will be held in one city, Rio de Janeiro, the earlier event, the soccer World Cup, will be nationwide. This is a complex task and Brazil needs to get its under-invested, sub par infrastructure up to speed - and fast. While the economy has been growing and it has enjoyed a decade of healthy financial figures, investment in infrastructure has not kept the same pace. If there is a bright side, it is the fact that, soccer tournament preparations may be creating some official headaches, they are also bringing some much needed attention to the infrastructure problem. And, when the final whistle is blown at the soccer tournament on July 13, 2014, talk will turn to whatever legacy the tournament has left behind. If the government makes the right decisions over the next couple of years, that legacy might be better infrastructure and more modern transport alternatives everywhere, as befits a growing, modernized economy. Until then, there is still a long way to go, but it does seem that the government has awakened to the fact that it had better act quickly. For beginners, work has begun on the So Paulo stadium where the opening game will be held but down at the other end of the scale, construction has yet to begin on Natal Stadium, in the northeast. President Rousseff has conceded that some of the work is behind schedule, but insists that they are taking the necessary steps. "I feel confident that Brazil will be ready in 2014 to present the best World Cup. 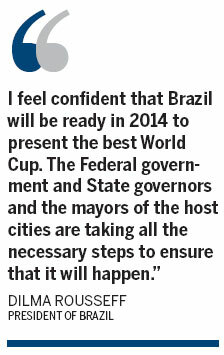 The Federal government and State governors and the mayors of the host cities are taking all the necessary steps to ensure that it will happen," Rousseff said recently. Brazil is planning on spending $14 billion on projects directly related to the World Cup. It is likely that upwards of 90 percent of that will come from the public sector, as some observers fear that the government has not provided the necessary guarantees and regulatory changes to attract more private capital. There is evidence of this in the state-heavy financing of the projects, where the state-run development bank BNDES is financing most of the big developments. That is because it can offer subsidized loans at lower interest rates than private banks. Still, the rapid growth of its loan book has caused some concern. More than $96 billion came through BNDES loans last year, tripling the amount doled out by the World Bank. Eventually, BNDES will be financing a smaller percentage of the projects, bringing the prospect of greater private sector investment. And, opportunities for partnering or collaborating with BNDES are increasing. One possible area for private-sector involvement and general investment possibilities is the country's airports. BNDES may back as much as 70 percent of the necessary airport investment which the government plans to privatize, but the remaining 30 percent can be taken up by the private sector. It is difficult to see why there would not be many takers. The government is planning to auction off contracts in December for running three airports, in So Paulo, Campinas, and Brasilia. In the infrastructure sense, this will give Brazil the extra capacity it needs for the World Cup, and, from the investment side, it is allowing private investors to get a larger stake in the country's future. Meanwhile, with the growing demand for air travel in the country - the sector grew 23 percent last year - private investment could take some of the strain off the beleaguered airports. In August, Brazil auctioned off its first concession for a private company to build and operate a major airport. There were four contenders for new airport terminals near the northeastern city of Natal. The winning bid came from Infra-America, a Brazil-Argentina consortium consisting of the Brazilian engineering contractor Engevix and the Argentine conglomerate Corporacin America. This proved that foreign investment, even though it is from a neighboring country, is welcome in developing Brazil's infrastructure. The winning bid came in at $106 million, more than three times the reserve price set by the government. They have three years to build the So Gonalo do Amarante Airport and will hold the operating rights for 25 years, with an option to extend. The government is also at the study stage on a licensing deal for building airports in Rio de Janeiro and Belo Horizonte. Some analysts say that Brazil will need up to $22 billion in investment before 2030, to ensure that capacity is in line with demand. The current capacity is 130 million passengers, and that is expected to reach over 300 million in the next 20 years, with air traffic demand growing at 7 percent plus, a year. Manaus airport is also pegged for an expansion. There are so far 12 companies vying for the $245 million tender. Infraero, the Brazilian federal airport authority, announced that the tender is for expanding the passenger terminal at Eduardo Gomes International Airport in the Amazonas state capital and World Cup host city, Manaus. Work on the 24-month construction project will begin in December and be completed six months prior to the World Cup, in December 2013. That will more than double the passenger terminal, to 97,000 square meters, and provide two new gates, which will bring the number to eight. Passenger capacity is expected to grow to nine million a year, up from the current four million. And, it is not the airports that are getting all the attention, since some infrastructure projects are already underway. One company in this sector is already making a difference. That is MBR, (Mascarenhas Barbosa Roscoe Construes. ), which has been around since 1934, and is leading the way, alongside many multinationals. MBR is based in the state of Minas Gerais but has multiple projects across the country. MBR works mainly in the industrial construction segment, in concrete works for roads, as well as "works of art", such as bridges, viaducts, shopping centers and sanitation works. In this, it is cooperating with VALE and Grupo Arcelor Mittal, some of Brazil's largest companies. For them to trust MBR is a stamp of approval, and a sign of commitment, efficiency and the ability to deliver results on time. The president of MBR, Luiz Fernando Pires, has commented, "We're a company you can trust. If we take on a project, we always deliver, with added safety and environmental awareness. We have strict standards for quality service and innovative technology, and are ISO 9001, ISO 14000 and 18000 certified." With the expected demand in civil engineering projects expected to increase in coming years, MBR's track record, expertise and relationships with larger operators could put them head and shoulders above the competition and help them grow. It is important to keep up with the latest technology in any sector, especially in construction. Moreover, workers need to be trained to effectively utilize this technology to remain competitive. "We don't want to be the biggest, but rather the best industrial construction company in the country," explained Pires, and technology plays a big role in MBR maintaining its competitive edge. The rail system is also in need of a capital injection and at least in one city, Rio de Janeiro, this is also bringing business to Chinese companies. The city's urban mass transit system connects 12 neighboring cities and carries over 500,000 passengers daily. In preparation for the World Cup and the Olympics the city has placed an order for 30 inter-city trains - the first of which was delivered in July. This is the biggest bidding project for the city's transit system in 40 years and it is also the largest loan project in South America for the World Bank. The city will also launch an international bidding round for a further 60 trains later this year. Brazil's next challenge will be a nationwide, high-speed rail network. This seems to have been put on hold for the time being, after bidding on a high-speed rail line between So Paulo and Rio de Janeiro was cancelled, for the third time in July, due to lack of interest. But, the high-speed rail dream may be one area where the government will have to assume more of the risk - as has been the case in China - because of the long-term investment and delay in making a profit. Still, since these big-ticket projects are getting underway, Brazil seems to be taking the infrastructure question more seriously. The government just needs to keep up the momentum and push the accelerator when necessary. During Rousseff's visit to Beijing in April, there was an announcement that there is room enough for China to invest in Brazil's infrastructure. "The governments of China and Brazil recognize the potential for establishing Brazilian-Chinese partnerships in infrastructure projects related to the 2014 World Cup and the 2016 Olympic Games," it said.